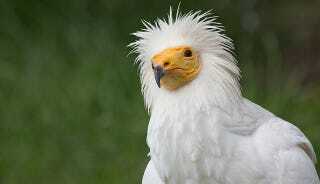 Scientists were thrilled when they learned about the eating habits of the Egyptian vulture. Its favorite food is the egg, which it cracks open using stones. This meant one thing — it was time to mess with the bird's head in the name of science. It's a big deal when an animal knows how to use a tool. The behavior is so uncommon that, for quite some time, researchers believed that only humans had the capacity to use tools. It's possible that they slightly resented being proved wrong by the likes of the Egyptian vulture, which grabs ostrich eggs from the nest and smacks them open with stones. As soon as researchers found out about the tool use, the mind games started. The experimentation began gently. The scientists presented the vultures with a variety of stones and recorded which ones they chose for egg-cracking. The vultures chose egg-shaped rocks. Once the researchers were sure that the vultures knew how to pick a rock, they wanted to see how the vultures picked an egg. Suddenly, ostrich eggs became scarce in vulture enclosures. They were replaced with green eggs, red eggs, blue eggs. Overnight, it became vulture easter, except without any treats; just dummy eggs that couldn't be broken. Researchers found that the vultures would still gamely try to break open the red and green dummy eggs. Why not go further? They replaced the round eggs with cubic eggs, at which point the vultures lapsed into sulky inaction, not recognizing these oversized dice as eggs. The researchers decided to switch from observation to kidnapping. They grabbed vulture chicks before they could watch the egg-smashing behavior. Oddly, the chicks did know, without any instruction, how to use rocks to smash ostrich eggs. What they didn't know was that they should eat ostrich eggs at all. Only when researchers left a broken-open egg in the enclosure did the chicks realize that something inside the eggshell might be worth eating. The moment they knew, they went straight for their throwing-rocks. So do Egyptian vultures innately know how to break eggs, without innately knowing that the contents of eggs are worth eating? Or are they just smart enough to come up with a practical solution to a problem once they learn about a new food source? Needs more experimentation!